This morning at just past 6:30 Wisconsin’s gun deer season opened. I’m not sure anyone who is not from a part of the country where people hunt could understand the excitement hunters feel this time of year. My students, both girls and boys, were heading off to the woods with their families and friends to enjoy the outdoors and the camaraderie of pitting their wits against their prey. They mostly want the bragging rights of killing a big trophy deer, but many of them put food on their families’ tables with the deer they kill. Hunting is not just an activity here in Wisconsin; it’s a tradition families share that brings them closer together without the distractions of the modern world to interfere. My husband decided not to hunt this year, so we had the luxury of waking up late, at nearly seven o’clock. Usually during hunting season gun shots wake us up, but this year we heard none. I’m not sure why the hubby decided not to hunt. Maybe he felt bad about the deer he shot two years ago. That’s the last time he ventured out. She was a doe with a yearling, obviously hers. When he took the first shot, he missed her, but neither she nor the yearling ran away. When he took the second shot, he dropped her on the spot. The yearling only ran about a hundred yards away. Bruce couldn’t bring himself to shoot the youngster which finally ran off when Bruce went out to”process” the doe. It was kind of sad. He talked about that kill for a while but in a wistful way. Later that year in autumn a young buck made our backyard his home. He was a big deer, tall and strong, but obviously young. We saw him often on the perimeter of our property, but he ventured closer each time he appeared, finally coming into our yard. Our Lab Stella believes it her mission to keep our property deer free. She loves seeing deer in our yard, then running full-speed to chase them off the property. For her it is great fun. One day I let her out to chase away this big, young buck I mentioned. She was appropriately fierce, but the buck stood his ground though not in a defiant way. He was curious about Stella. When she ran out barking at him, he put his head down and took a couple of steps in her direction. Unnerved, she ran a few yards away and barked again, her hackles raised. The buck stayed put. They stared each other down for a few moments before Stella lost her nerve and came inside. This same scenario repeated a few more times when this buck visited our yard. Then we didn’t see him for a long time. This morning when I looked out the window of my bedroom, I saw a big eight point buck grazing on the grass next to the stream in our back yard. He was quite at home. “Do you think that’s Stella’s deer?” I asked Bruce. We let Stella out the front door so she wouldn’t see the buck and he wouldn’t see her. We fed her, poured ourselves some coffee, then watched him graze and amble through the back yard only about fifty feet away from the windows. He was magnificent with a big basket of a rack, antlers nearly white in the early light. When he had nearly reached the treeline, we pointed him out to Stella. Since not many deer have been wandering through our property of late, she had almost forgotten about them. Once we showed him to her, however, she growled and was ready to run, stamping and whining at the door. Bruce opened the sliding glass door. Stella sprinted toward the deer, clearing the steps to the backyard in one leap. She barked as she ran. The buck raised his head. He didn’t move. He didn’t startle. He looked as though he recognized her. She skidded to a stop, turned around with a glance and a token growl over her shoulder, then trotted back to the porch. 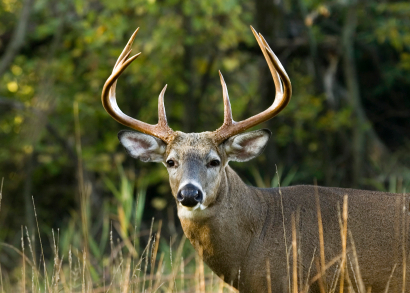 I watched the buck walked toward the power lines and marveled at his power and grace. I liked that this beautiful creature was still with us, still walking the property that he believes is his, still trying to make friends with a prickly creature who wants nothing to do with a deer who isn’t afraid of her. I think Bruce regretted not having a hunting license this morning, but I’m glad he didn’t. If that was Stella’s buck–and I hope it was–I hope he survives this year’s gun deer season. I would like to see him again.